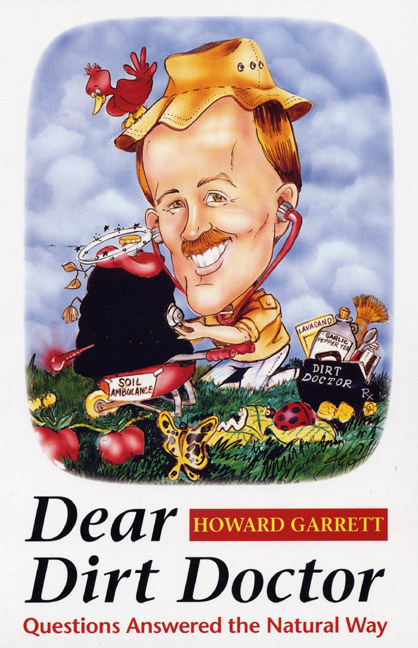 In this revised and updated edition of The Dirt Doctor’s Guide to Organic Gardening, Howard Garrett uses a question-and-answer format to present a wealth of new information on organic gardening, landscaping, pest control, and natural living. Howard Garrett is a landscape architect, certified arborist, horticulturist, and organic practitioner in Dallas, Texas. He promotes his organic gardening program, The Natural Way, through his WBAP radio and Channel 8 TV shows, weekly column in the Dallas Morning News, monthly Dirt Doctor's Dirt magazine, and regional and national speaking engagements. There are many reasons to go organic and stop using synthetic toxic pesticides and high-nitrogen artificial salt fertilizers, but here are the ten most important reasons. 1. The organic program improves health. Organic fertilizers, soil amendments, and pest control products improve the health of the microscopic life in the soil, the earthworms, the roots of plants, the top growth, and the overall production of plants. In addition, you, your family, and your pets don't have to be exposed to toxic chemical poisons. The organic method works within nature's laws and systems and is nontoxic to beneficial insects, birds, lizards, frogs, toads, earthworms, and other life. Pets and humans can be added to the list. Even the manufacturers of the toxic chemicals admit—in fact, brag about—the fact that their products kill all the bugs. That's right—they can't tell the difference between the good and the bad bugs. 2. The organic program is cost effective. Any project can be converted from toxics to organics at the same budget, but what is more important is that the costs are reduced every year in an organic program. Each year fewer sprayings for pests are needed, fewer dead plants have to be replaced, and plant production continues to increase. And what price do you put on your pets' health and your health? Beds never have to be removed and redone, as is often the case under chemical programs. Under an organic program, the soil gets better and better forever—just as the forest floor and the tall prairie grass do. 3. Organic programs save time. Because of the healthy soil, less irrigation is needed, less fertilizer is needed, and less frequent replacing of diseased and dead plants is needed. Doing these things less often saves time compared to the recommended synthetic schedule. Another time convenience is that the timing of the organic applications is not as critical. The season's first fertilization can go down whenever time allows after the first of the year; the second, whenever time allows in late spring to early summer, and the third, whenever time allows in the late summer through fall. Since the organic fertilizers aren't soluble, they can be broadcast basically anytime. The nutrients become available to the plant roots when the temperature and moisture conditions are right for the feeding of soil microbes. In the meantime, they stay in place and behave themselves. 4. Organic programs result in sick and insect-infested plants less often. When adapted plants are chosen and planted correctly in the proper place, they have few pests and require little care. High-nitrogen synthetic salt fertilizers and toxic pesticides are problem creators. They lead to more pest problems than anything else, partly because of the destruction of beneficial microbes and insects, but more importantly because of the weak, watery cells created by the fake fertilizers. Organic fertilizers and organic pest control techniques are problem solvers. They concentrate on stimulating health rather than on fast production. 5. Organic programs provide greater summer heat tolerance. Plants growing in soil that is rich in compost, rock minerals, and beneficial living organisms have a greater resistance to all stresses, including severe heat stress. Trace minerals are an important part of this stress tolerance. They are abundant and available to plants in an organic program. Organically grown plants have larger and more efficient root systems. The root systems respond even more than the top growth does, and they are the key to healthy plants. 6. Organic programs provide greater cold tolerance. When the proper balance of organic matter, mineral nutrients, air, and living organisms is present in the soil, ornamental plants and food crops have a greater concentration of complex carbohydrates, or sugars, and these sugars create a natural antifreeze effect. Trace minerals again are a very important factor here. Many Texas organic growers have personally experienced these benefits. Freeze damage occurs on organically grown plants at a temperature significantly lower than on plants artificially grown. 7. Organically grown fruits, vegetables, and herbs taste better. The increased trace minerals and complex sugars in organically grown plants increase their taste. Taste is directly related to the health and nutrition of the food. So-called experts will argue this and other points of mine, but they are wrong. There's a very easy test. Eat fruits and vegetables grown both ways and see which you like better. Also, the use of toxic poisons eliminates, or should eliminate, the use of many foods and herbs. The best example is the rose. If you are not spraying poisons and dousing the surrounding soil with toxic synthetics, the petals are edible and are delicious in salads and teas, and the hips, which are the rose fruits, are delicious in teas and one of the best sources of natural vitamin C.
8. Organic programs improve the environment. Unlike synthetic fertilization, organic programs don't cause excess nitrogen to volatilize into the atmosphere nor soluble nutrients to leach through the soil and into the water stream. Organic fertilizers stimulate beneficial microorganisms, which very effectively clean up contaminations such as pesticides, excess mineral salts, and heavy metals in the soil. Leaching is reduced to almost nil, and no one has to breathe the fumes or otherwise come in contact with the toxic materials. 9. Organic programs recycle valuable natural resources. All once-living materials are rotted through composting and mulching and recycled back into the soil to build humus and trace minerals. Grass clippings are left on the turf, leaves are left as mulch in beds, tree trimmings are turned into mulch, and animal manures are composted to become important fertilizers. Under the synthetic programs, these valuable resources are often taken to landfills. 10. Organics is more fun. It's really no fun to spill toxic poisons all over yourself, breathe the fumes, or have to deal with the contaminated containers and residues. Under an organic program, the ease of application, the great diversity of life that's experienced, and the successful production of plants truly create some of life's great pleasures. One of the most common questions I get relates to getting started. It usually goes something like this: "I've tried Texas A&M's chemical approach, and it isn't working. I'm ready to give the Natural Way a try. How do I start?" Here's how to make the conversion. Step 1: Stop using all synthetic fertilizers and pesticides. Step 2: Start recycling organic matter, building soil health with organic products, composting, and mulching. Step 3: Use native plants and well-adapted introductions. For those of you who are new to the Natural Way of thinking and for those of you who are veterans, here's an update on the Basic Organic Program, or the BOP for short. The more we learn, the simpler it gets. Planting well-adapted plants is the most important step. Unless you select adapted plants, it doesn't matter whether your program is organic or toxic. The best choices are the na tives, but the well-adapted introductions and naturalized plants are also good. Healthy gardens, farms, and ranches need a mix of plants and animals. Monocultures of plants are often very productive for a while, but later succumb to insects and diseases. Examples include the Irish potato blight, Dutch elm disease, and, more recently, oak wilt here in Texas. Monocultures lack the genetic diversity to respond to changing environmental threats and thus become sitting ducks for parasites, predators, and pathogens. Stop using all products that do damage to the life in the soil. Encourage life instead. Use compost, earthworm castings, and organic fertilizers to build the organic matter or humus in the soil. Mulch all plantings. Maintain an organic mulch layer on the bare soil year round. Avoid all synthetic fertilizers that contain no organic matter. Balance the minerals in the soil by applying rock powders or sands that provide the major nutrients and trace minerals needed by plants to be healthy. Volcanic rock materials are es pecially important because they provide much more than minerals. The best choices include lava sand, Texas greensand, soft rock phosphate, granite sand, zeolite, basalt, and natural diatomaceous earth. Prepare beds for ornamentals or food crops by scraping away existing grass and weeds. Toss the material into the compost pile. Spraying a herbicide first is an unnecessary, contam inating waste of money and time. Next add a 4-6-inch layer of compost, lava sand, or other volcanic material at 40-80 pounds per 1,000 square feet, organic fertilizer at 20 pounds per 1,000 square feet, wheat/corn/molasses amendment at 30 pounds per 1,000 square feet and till to a depth of 3 inches into the native soil. Excavation and additional ingredients such as concrete sand, peat moss, foreign soil, and pine bark should not be used. They are a waste of money and can hinder plant growth. More compost is needed for shrubs and flowers than for ground covers. Add Texas greensand at 40-80 pounds per 1,000 square feet to black and white soils and high-calcium lime at 50-100 pounds per 1,000 square feet to acid soils. Decomposed granite is an effective amendment for most soils. It can be used up to 100 pounds per 1,000 square feet. Remove container-grown plants from their pots, rake the loose soil off the top of the ball, and set the plants in the new beds at a level slightly higher than the surrounding grade. Remove the cloth and excess soil from the top of balled and burlapped plants. Mulch all shrubs, trees, ground covers, and food crops with 2-5 inches of shredded native tree trimmings to protect the soil from sunlight, wind, and rain; inhibit weed germination; decrease watering needs; and mediate soil temperature. Other natural mulches can be used, but avoid Bermudagrass hay because of possible herbicide residue. Apply organic fertilizer 2-3 times per year. Foliar-feed during the growing season by spraying turf, tree, and shrub foliage; trunks; limbs; and soil at least monthly with Garrett juice or other organic blends. Add volcanic sand such as lava sand, dry molasses, and humate to the soil the first few years. Water only as necessary. The organic program will reduce the frequency and volume needed. Add a tablespoon of apple cider vinegar per gallon when watering pots. Do as often as time permits. Use 1 ounce of liquid humate per gallon of water in areas with acid soils and water. Hand pull large weeds and work on soil health for overall control. Mulch all bare soil. Avoid synthetic herbicides, such as pre-emergents, broadleaf treatments, soil sterilants, and especially the SU (sulfonylurea) herbicides such as Manage and Oust, as well as Picloram and Clopyralid products. Spray broadleaf weeds as a last resort with full-strength vinegar with 2 ounces orange oil and 1 teaspoon of liquid soap or remove weeds by hand. Several commercial organic herbicides are now available, including Garden-Ville Organic Weed Control, Weed Eraser, Burn Out, and others. Some of these products contained diluted glacial acetic acid in the past. Use only products that contain natural vinegar or vinegar made from ethyl alcohol. Remove dead, diseased, and conflicting limbs. Do not overprune or make flush cuts. Leave the branch collars intact, and do not paint cuts except on red oaks and live oaks in oak-wilt areas when spring pruning can't be avoided. Remember that pruning cuts hurt trees. For the most part, pruning is done for your benefit, not for the benefit of the trees. Compost, nature's own living fertilizer, can be made at home or purchased ready to use. Compost can be started any time of the year in sun or shade, and its ingredients can include anything that was once living—grass clippings, tree trimmings, food scraps, bark, sawdust, rice hulls, weeds, nut hulls, animal manure, and the carcasses of animals. Mix the ingredients together and simply pile the material on the ground. See the "Compost" chapter for further information. Manure compost tea is an effective foliar spray because of its many mineral nutrients and naturally occurring microorganisms. Fill any container half full of compost and finish filling with water. Let the mix sit a few days and then dilute and spray on the foliage of any and all plants. Pumping air into the tea with a simple aquarium pump increases its power. How to dilute the dark compost tea before using depends on the compost used. A rule of thumb is to dilute the leachate down to one part compost liquid to 4-10 parts water. The ready-to-use spray should look like iced tea. Be sure to strain the solids out with old pantyhose, cheesecloth, or floating row-cover material. Full-strength tea makes an excellent fire ant mound drench when mixed with 2 ounces molasses and 2 ounces orange oil per gallon. Add vinegar, molasses, and seaweed to compost tea to make Garrett Juice. Aphids, spider mites, whiteflies, and lacebugs: Release ladybugs and green lacewings regularly until natural populations exist. Spray Garrett juice or garlic-pepper tea. Use strong water blasts for heavy infestations. Caterpillars and bagworms: Release trichogramma wasps. Spray Garrett Juice plus 2 ounces orange oil per gallon. Spray Bacillus thuringiensis (Bt) with 1 ounce molasses per gallon of spray as a last resort. Fire ants: Drench mounds with Garrett juice plus orange oil, release beneficial nematodes, and go totally organic. Grasshoppers: Eliminate bare soil, apply beneficial nematodes, broadcast Nolo Bait for the young nymphs, and spray kaolin clay particle film if needed. Encourage biodiversity and feed the birds regularly. Grubworms: Beneficial nematodes and general soil health are the primary controls. Mosquitoes: Broadcast cedar flakes and use cedar mulch. Use Bacillus thuringiensis 'Israelensis' (Bti) for larvae in standing water that can't be drained. Spray orange-oil-based products or garlic-pepper tea for adult insects. Do not use toxic chemicals such as pyrethrins, pyrethroids, or DEET. Lavender, vanilla, citronella, and eucalyptus also repel mosquito adults. Slugs, snails, fleas, ticks, chinch bugs, roaches, crickets: Spray or dust natural diatomaceous earth products and broadcast cedar flakes and crushed red pepper. Orange-oil-based products also kill these pests. Research now shows that instant coffee at 1 ounce per gallon of spray is effective. For more details on pest control, check out the Texas Bug Book. For black spot, brown patch, powdery mildew, and other fungal problems, the best control is prevention through soil improvement, avoidance of high-nitrogen fertilizers, and proper watering. Spray Garrett Juice plus garlic, potassium bicarbonate, milk, or neem. Treat soil with horticultural cornmeal at about 20 pounds per 1,000 square feet. Organic gardens have few disease problems, but these natural techniques work well. Plants can also be sprayed with corn juice, which is made by soaking cornmeal in water (put the cornmeal in old nylon hose to keep the larger particles from the juice). The commonly recommended synthetic neurotoxins like Terrachlor, Daconil, Bayleton, and Funginex have no place in today's horticulture and agriculture. In a blender with water, liquefy 2 bulbs of garlic and 2 cayenne or habanero peppers. Strain away the solids. Pour the garlic-pepper juice into a 1-gallon container. Fill the remaining volume with water to make 1 gallon of concentrate. Shake well before using and add 1/4 cup of the concentrate to each gallon of water in the sprayer. To make garlic tea, simply omit the pepper and add another bulb of garlic. For additional power, add 1 ounce of seaweed and molasses to each gallon. Always use plastic containers with loose-fitting lids for storage. For one of the best foliar sprays and soil drenches, mix the following per gallon of water: 1 cup of compost tea or liquid humate, 1 ounce liquid seaweed, 1 ounce blackstrap or any dark molasses, 1 ounce apple cider vinegar. To make a mild insect-control product, add 1 ounce citrus oil per gallon of spray. To make the fire ant killer, add 2 ounces citrus oil per gallon. When spraying the foliage of plants, don't use over 2 ounces citrus oil per gallon of spray. This mixture also works as a soil-detoxification product if you are just starting your organic program. The above is a simplified version of the overall plan, but it should be helpful in giving you a good starting point. More details on each point are found further in the book. Welcome aboard. I'm sure you will enjoy learning the Natural Way. Organic gardening is not just a matter of using different kinds of fertilizers and pesticides. Changing from Orthene, diazinon, Dursban, and Sevin to diatomaceous earth, garlic, hot pepper, and citrus oil is not the main objective. Neither is changing from Peters 20-20-20, Miracle-Gro, ammonium sulfate, and other high-nitrogen synthetics to cottonseed meal, manure compost, seaweed, molasses, and bat guano. More than just switching products, the organic method requires a complete change of attitude and a completely different thought process. The synthetic chemical approach deals only with the chemistry of the soil. In so doing, it basically ignores the two other major pieces of the puzzle—physics and biology. Physics relates to the physical structure, texture, aeration, and drainage of the soil. Biology relates to the living organisms in the soil—the insects, microbes, and earthworms. Healthy soil must have a balance of chemistry, physics, and biology. Whatever is done to any of the three factors affects the other two. The chemical fertilizer approach doesn't even handle the chemistry properly because the synthetic fertilizers lack carbon and any useful amount of trace minerals. In addition, the physics and biology are completely ignored. If the chemistry is properly improved by using balanced fertilizer, the physics and biology will immediately improve. Improve the physics by aerating, and the biology and chemistry will improve. Improve the biology by adding biostimulants or actual living organism products, and the physics and chemistry start improving immediately. The chemistry, physics, and biology of the soil are directly related, and it's extremely important that they be functioning properly. How do you use this knowledge effectively or apply this simple thought model? Ask yourself this question: If I use this product, fertilizer, soil amendment, or stimulant, will it benefit or hurt the earthworms? If only those products that benefit the living organisms are used, the soil fertility will improve with every application, and nature will balance the chemistry, physics, and biology for you. The only testing lab in Texas that provides information on what nutrients are actually available to plants is Texas Plant and Soil Lab in Edinburg: 956-383-0739, www.txplant-soillab.com. Other labs use harsh acids to break down the soil into its basic elements. These tests offer no help on what nutrients are available. It is also the only testing lab to give organic fertilizing recommendations as a standard procedure.